Tell the kids it is strained brains and you couldn't get all the eye balls out. They'll love it! Happy Halloween! 1. Melt 1 tablespoon of the butter in a 12-inch nonstick skillet over medium heat. Add the chopped broccoli stems, shallots, garlic, salt, pepper, and nutmeg; cook, stirring, until the shallots are tender, 3 to 5 minutes. 2. Add the broth, cover, and simmer 20 minutes, until the broccoli stalks are tender and the liquid almost evaporated. Remove from the heat, add the cheese, and toss to combine. Working in batches, transfer to a blender and purée until smooth. 3. Bring a large pot of lightly salted water to a boil. Add the florets and cook for 3 minutes. Drain and rinse under cold running water to stop the cooking. 4. Cut a notch in the side of each egg and press an olive into it. Heat broccoli purée over medium heat until just warmed through, 5 minutes. Stir in the florets and the remaining butter. 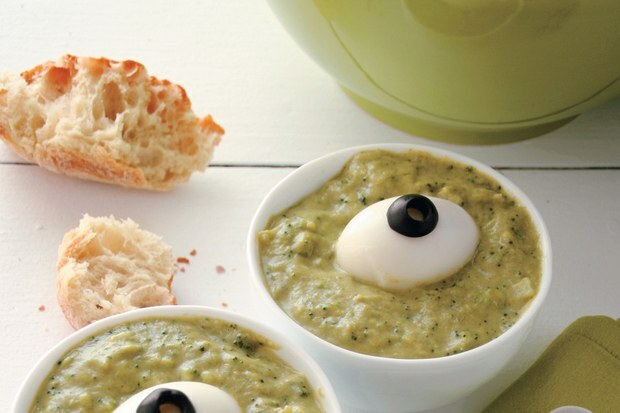 Spoon the gruel into individual soup bowls and top each with an egg eye; serve immediately.